Robert, I heard you were running 6 PSI and made 550whp. Dude, I know for a fact that Robert used a Dynojet, is running 6 PSI, and made 550whp. Both of us had a similar reaction -- laughter -- because this information didn't come from anybody with any direct or even indirect knowledge of my project -- it was all apparently made up from thin air. Over the week, I probably received at least 12-15 phone calls, text messages, emails, and PMs. It sounds like a lot of people had heard this rumor and thought it was true. It's flattering to know there's so much speculation because it means a lot of people are following the car's development and are very interested in the results. But the rumor was false, and I'm here now to post the real numbers from my yesterday's independent dyno tests. Until two nights ago (a week later), I hadn't even decided which dyno to use -- let alone decided to use a Dynojet. Regular readers know that I prefer the Dynapack because it's extremely accurate and works on the same exact principle as a motor dyno. However for this round of testing, I didn't want to use it because if it places enough hydraulic load on the drive train to stop it; and I'm very concerned that my torque may be pretty high. I simply don't want to put that much load on the clutch, transmission, and drive shafts. 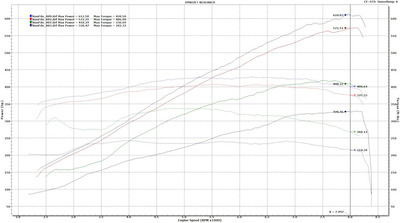 Whatever dyno I used, I wanted to have some base runs on the same dyno with the stroker motor so I could have something to compare against. So that leaves me with only two choices: Dynojet and Dyno Dynamics. To me, Dyno Dynamics was out of the question because: 1) The results are very easy to manipulate, and easy to call into question; 2) They don't offer a viewer for people to download, read, and compare dyno charts. I've always made my dyno charts available for download, so that meant my only choice would be the Dynojet. The kit delivered on the car was somewhere between VT2-575 and VT2-600. The kit included all of the VT2 hardware, but ran boost lower than the ESS VT2-600. The VT2-575 runs 5.5 PSI while the VT2-600 runs 6.5 PSI. We were running right in between somewhere near 6 PSI. But until we got it on the dyno and collected the boost data, we didn't know that either. At the dyno, we wanted to test two different pulleys. The kit came with a large pulley (low boost) and a smaller pulley (higher boost). The exact PSI rating is a little hard to determine. On the dyno, we connected a boost guage and captured boost data. This allows us to dump the data into a spreadsheet, create a trend line, and determine the boost settings. Since some runs stopped near 8000 RPMs, and others shot higher, I thought it would be most important to have a common set of data for determining boost. 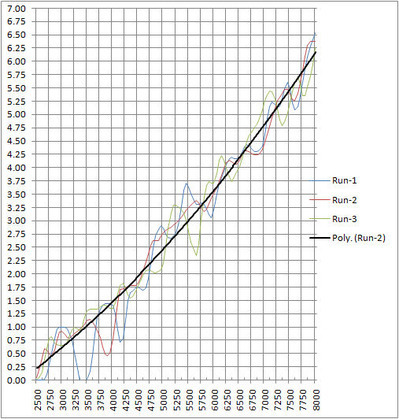 Therefore, I created the trend line from 2500-8000 RPMs, and used the value at 8000 RPMs as the official ESS-46 boost rating. It may not be perfect, but at least it's a method that can be used for future development. The large pulley (shown in the graph below) demonstrates that we are right at 6 PSI as the car was delivered from ESS. The smaller pulley was just barely smaller. As you can see from the graph, the trend line shows boost near 6.25 PSI -- again, very modest and very conservative setting. Before heading out to the dyno, I filled up with Mobile 91 octane in Newbury Park. I drove into Los Angeles to meet up at the dyno shop. We planned to run on the Dynojet with the low boost pulley, followed by a pulley change and then higher boost pulley. We never unstrapped the car from the dyno -- it stayed attached during the entire operation. Typically, we allowed about 3-4 minutes between runs. We never iced to cooler, plenum, or anything else because we don't believe in cheating. We collected AFR, SPARK, and BOOST with each run. There was one run where we used the boost gauge for another purpose, so if you see the boost data missing from that run, you'll know why. I had an idea what to expect for power with the low boost pulley since the ESS dyno testing was performed with that configuration. But we had no idea how much power or how much boost would be measured with the high boost pulley. Since there seems to be a preference for STD vs. SAE with some FI experts (I'm told STD is used on almost exclusively on E90Post), I've decided to post both results. You will notice the very strong and very flat torque curves. In some of the graphs, the torque never dips below 350 ft/lbs from 2500-8000+ RPMs, and even stays above 400 ft/lbs past 8000 RPMs. 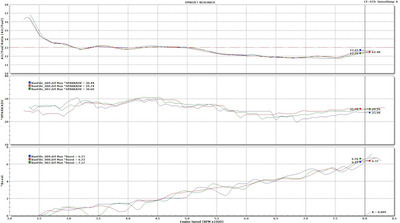 Here are the ESS-46 vs. RS-46 vs. Stock comparison dyno charts. 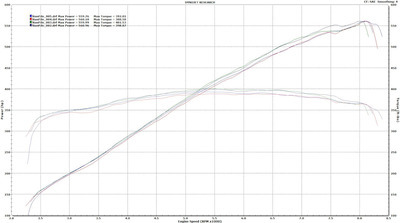 Unfortunately, these are the only Dynojet graphs I have of the RS-46 stroker on this same dyno. It's unfortunate because these were some of the very first dyno charts taken, when the ECU was untuned by ESS, and we still had the nasty torque dip. But nonetheless, they are good for a relative comparison. I took some videos with the iPhone. There's not the best quality, but they are something. 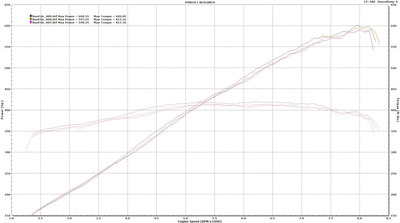 At the link below are the actual dyno files from the ESS-46 dyno runs. These dyno charts include all of the AFR, Spark Advance, Boost, and of course horsepower and torque. For those of you who have followed my development process, you know I always provide this level of details. It's one thing to claim you make a lot of power, but it's another thing to back it up in a verifiable way -- no BS, not hiding boost, no race gas, no icing the manifolds and coolers between runs -- just straight numbers. That's the way it should be. I have a growing collection of other people's Dynojet files, which makes it possible to pull up many comparisons. I'm hoping that others will also make their files available for download (especially vendors). If you're running NA, make sure to collect spark advance and AFR. If you're running FI, be sure to include spark advance, AFR, and boost. If your local dyno doesn't have the modules to collect this data, then find one that does. Once you get your files, make them available for download so others can build their own collections and make their own comparisons. This page contains a single entry by PencilGeek published on February 28, 2010 10:03 AM. Video: BMW ESS-46 Supercharged / RD Sport stroker dyno @ 605whp was the previous entry in this blog. Preparing for the Mojave Mile -- T-Minus 47 Hours is the next entry in this blog.